The Harley came to the One Down Four Up workshop in a sad state, sans front end after a truck had backed over it. Parked up in a garage for the last 30 years, luckily it fell into the hands of a shop who could do it justice, and give it a new lease on life. 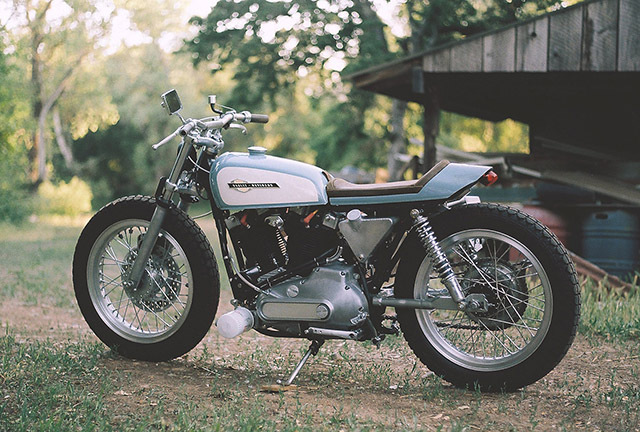 It was decided that the Harley XR750 should be the inspiration, but without going all the way to a full race duplicate. To do this the bike was stripped of it’s stock parts, giving a chance for the frame and swing arm to be given a fresh powder coating. A new rear sub frame was fabricated and mounted, and new steel rear body shell mounted, to suit the sporting aesthetic of the machine. At the front end, a clover style hub is mounted on a simplified Narrowglide forkset. The factory brake set was reversed, moving it from behind the forks to ahead of the forks. Bringing the pressure to the front brakes is a Nissin master cylinder pumping fluid through a stainless brake line. At the rear, the factory brake drum has been drilled. In the rolling stock department, a set of 19”Borrani WM3 rims are shod in Duro HF308. 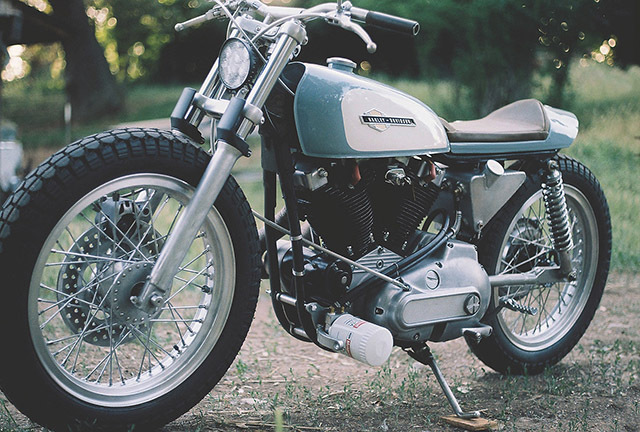 If the profile looks familiar, you’ll find it’s because these tires are a replica of the classic Pirelli MT-53 rubber that so many flat trackers raced on. The engine mods on this build are not massive, the idea of a high maintenance race bike being far from the minds of the builders. A remote oil filter has been mounted, a Uni air filter sits in place of the factory one. The shift controls have been inverted, and modified to suit the rearset riding set up. Electrics have been simplified, an Antigravity 8 Cell tucked up under the seat, the headlight being used on the build is a 4.5” LED unit, as well as an LED tail light. The exhaust system is a unique setup, the rear exhaust pipe wrapping itself around an engine cover to meet it’s sibling on the upturn. Stainless steel silencers from Cone Engineering point skyward, with the whole exhaust being ‘heat wrapped to keep your right leg safe’. 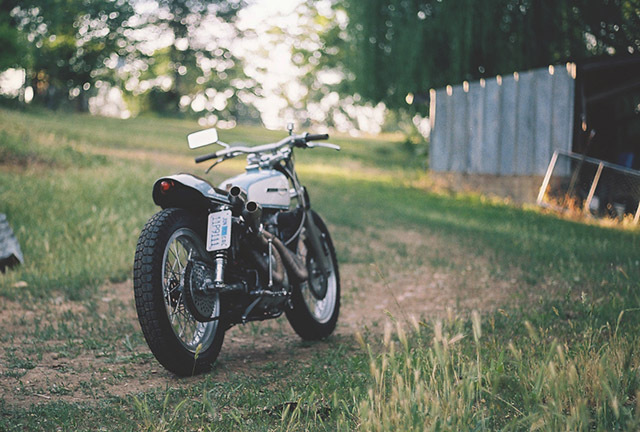 Aesthetically, the bike’s styling is subdued, it isn’t in your face. The lines are smooth, the One Down Four Up changing the traditional cruiser styling to something much more appealing. To keep the same theme running through the bike, the seat, foot pegs, kickstart and handlebars have all been wrapped in the same material. 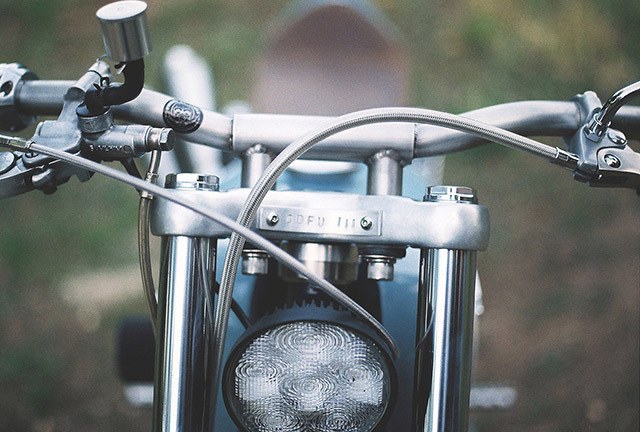 With a view to brushed metal, rather than polishing the bike is given a more utilitarian look, plus it saves time polishing that could be used riding. Sitting up under the freshly made seat is an aluminium oil tank, made in-house at the One Down Four Up workshop. 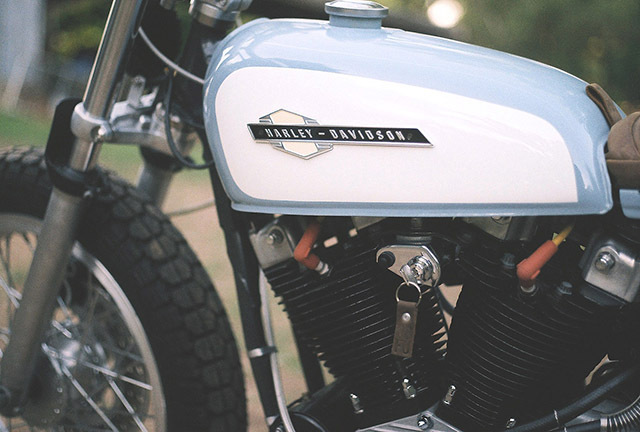 As well as the oil tank, a custom points & starter was fabricated to suit the style. 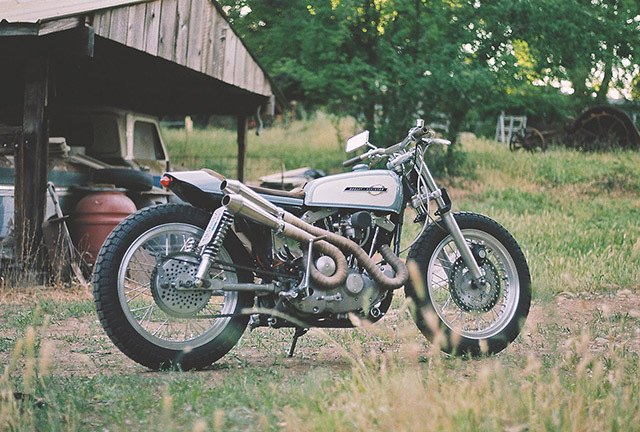 With a mid 70s barn find Harley as the solid platform for a build, The One Down Four Up workshop has created an American masterpiece. 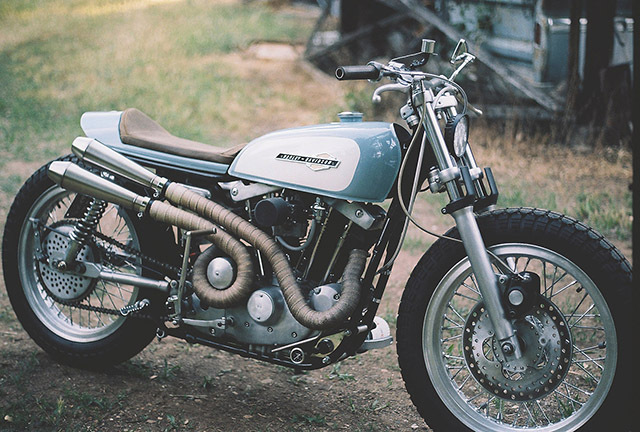 A superleggera version of it’s former self, this Ironhead Sportster has been built for reliability and rideability. 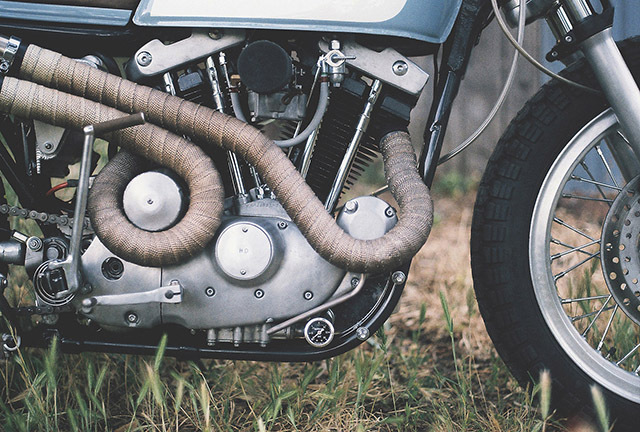 The exhaust system is an artwork in itself, and it complements the rest of the bike by not being over the top. 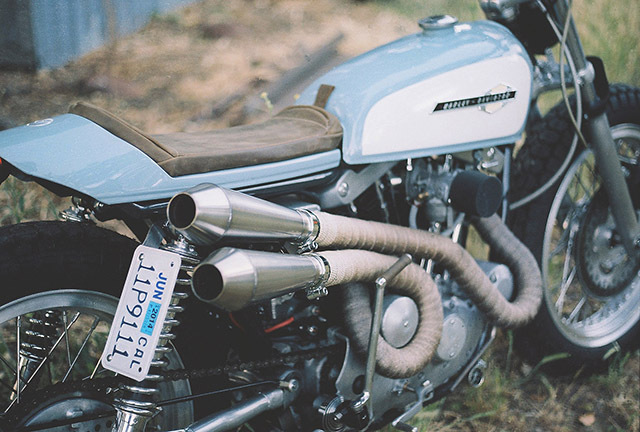 This view was shared when the bike was entered in it’s first show, taking out first place in the 1 Moto show in Portland, in the ‘Yes I Would’ category. This bike is certainly no dog.